Mnemonic and acronym are two interrelated concepts between which there exists a difference. 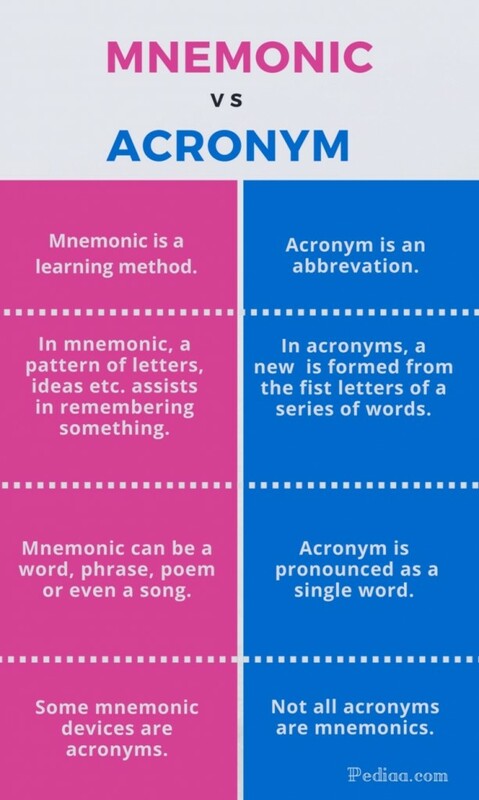 The main difference between Mnemonic and Acronym is that mnemonic is a technique of memorizing information through a pattern of letters, numbers or ideas whereas acronym is a type of abbreviation that comprises of using the first letters of a series of words to indicate a new word. Mnemonics are formed following the theory that it is easy for the human brain to remember spatial, personal, surprising, sexual, humorous, physical, surprising or otherwise relatable information, rather than impersonal and abstract data. As mentioned above mnemonics can be of several types and given below are some examples of these different categories. Indicates the order of the planets in the Solar system: Mercury, Venus, Earth, Mars, Jupiter, Saturn, Uranus, Neptune, Pluto. Helps you to remember the spellings of the word Geography. Gives instruction on how to treat a sprain; Rest the injured area, Ice the sprain, Compress with a wrap or bandage, Elevate the injured area. However, this does not mean that all mnemonics are acronyms or that all acronyms are mnemonics. Knuckle mnemonic for the number of days in each month. An acronym is a form of abbreviation where a word is formed from the fist letters of a series of words. 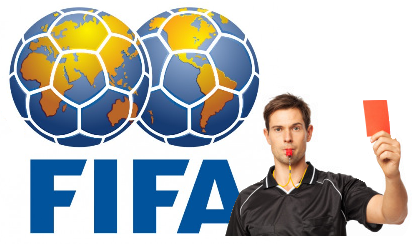 Generally this new word contains a vowel to facilitate the pronunciation of the word. The most significant feature of an acronym is that it can be pronounced as a new word, unlike initialisms. Although there exists a technical difference between initialism and acronyms, in usage, people use the term acronyms to refer to both these abbreviations. PAVPANIC is a mnemonic device that helps to remember the parts of speech in the English language. Mnemonic is a technique where a pattern of letters, ideas, or associations, etc. assists in remembering something. Acronym is an abbreviation formed from the initial letters of other words and pronounced as a word. Some mnemonic devices are acronyms. Not all acronyms are mnemonics. Mnemonic can be a word, phrase, poem or even a song. Acronym is pronounced as a single word.